Essential doesn't have too many products to sell, but if you're looking to buy their only smartphones, you're in for a nice surprise. 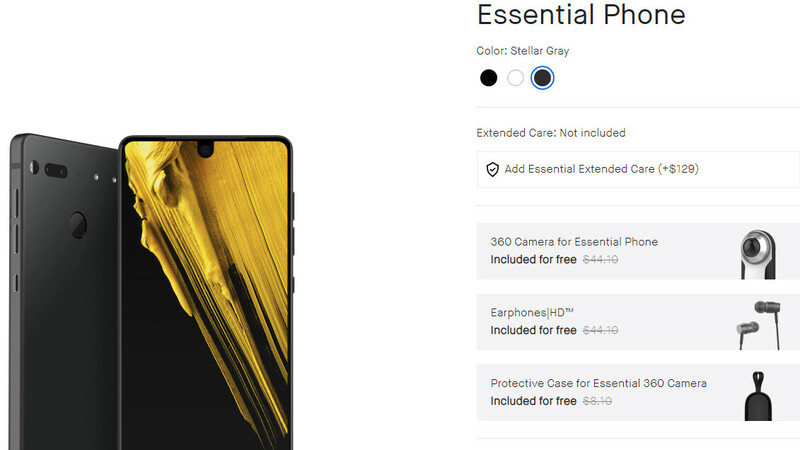 There's an Essential Phone Bundle that's now available on the U.S. company's site, which sells for just $329. The Essential Phone Bundle includes the Essential Phone, the 360 Camera ($44), the Earphones HD ($44), and the Protective Case for Essential 360 Camera ($8). There's an additional 15% discount on the Essential Phone Bundle for students too. Besides the Essential Phone Bundle, you can also get one of Essential's accessories for 10% offer during the Cyber Week promotion. The discount does not apply to Audio Adapter HD or Extended Care, but you can definitely get the Earphones Mini or Earphones HD slightly cheaper. Essential's Cyber Week promotion will remain live until December 2 or while supplies last, whichever is sooner. However, the Essential Phone Bundle will only be available until the end of November 26 (or while supplies last). What a deal. I said before and I'll say it again, the Essential phone is still the best bang for your buck available. It still rocking flagship specs, it has stock Android, it gets updates super fast sometimes even better than some Android One phones, and it's unlocked for ALL carriers. Can't beat that. But that camera... I owned it and I quickly returned it for that reason despite getting it a great deal. I use the camera all time, I'm not seeking dlsr photos and it works fine. With gcam and night sight, it's not bad at all really. But folks get caught up in picture battles and this will not rate with them I agree. Exactly. I think people are expecting too much when they want a phone to be like a DLSR camera. Doesn't work that way. For the price that it's at, the Essential phone is a great buy. The camera got better, almost good, after many updates including Pie. But if you're on T-Mobile the connectivity issues persist to this day. That was my only reason for moving on from this phone. Small footprint with a nice size screen and built like a tank. Unfortunately, it was little more than a fancy paperweight since it couldn't latch on to a signal more than half the time. There's no doubt some on T-Mobile found it to be useless for a signal, that's true. Oddly now and then one comes forward and says it's great, but not enough to note more than just in passing. On my CDN carrier, every bit as good as any other phone I've used. Just that band T-Mobile uses in states is beyond this phones abilities. It's a shame but is a issue just the same. See Crispin I can respect your criticism because you have experience with the phone and it didn't work out for you due to the T-Mobile band issue which is fair. At least you're not talking out of your backside like the other guy does.